Cattelan’s youth in the Italian city of Padua was marked by economic hardship at home, punishment at school, and a string of unfulfilling, menial jobs. These early experiences instilled in him an abiding mistrust of authority and a disdain for the drudgery of labor that haunts much of his early production. He describes his work from the late 1980s and early 1990s as being “about the impossibility of doing something…about insecurity, about failure.” His pronounced anxiety about not succeeding was manifested in a series of performative escape routes from his artistic obligations. Bereft of ideas for his first solo exhibition in 1989, Cattelan simply closed the gallery and hung up a sign reading Torno subito, or “Be back soon.” His early contributions to group shows were equally delinquent: in 1992, his participation in an exhibition at the Castello di Rivara near Turin consisted of a rope of knotted bed sheets dangling from an open window (Una Domenica a Rivara [A Sunday in Rivara]), while his response to the pressure of exhibiting at the Venice Biennale was to lease his allotted space to an advertising agency, which installed a billboard promoting a new perfume (Working Is a Bad Job, 1993). We are the revolution, Maurizio Cattelan. Cattelan has also turned to his own distinctive features as a mainstay of his iconography, constructing a series of sculptural vignettes that promote his image as an Everyman, playing the part of the fool so that we don’t have to. Notable examples include La Rivoluzione siamo noi (We are the revolution, 2000), which presents a diminutive Cattelan dangling by his collar from a metal coat rack, impudently dressed in the signature felt suit of German artist Joseph Beuys, and a 2001 installation created for the Museum Boijmans Van Beuningen in Rotterdam that depicts the artist peering mischievously from a hole in the floor at a gallery of Old Master paintings (Untitled, 2001). Some of Cattelan’s surrogates have been more allusive, such as the 2008 work Daddy Daddy, an installation first shown in the fountain on the Guggenheim’s rotunda floor, that depicts the puppet Pinocchio—another rebellious Italian boy with an oversized nose—floating facedown as if the victim of a tragic tumble from the ramps above. Although an ironic humor threads much of his work, a profound meditation on mortality forms the core of Cattelan’s practice. His recurring use of taxidermy, which presents a state of apparent life premised on actual death, is particularly apt for exploring this thematic concern. Perhaps the most poignant of his anthropomorphic animal scenes is Bidibidobidiboo (1996), in which a despairing squirrel has committed suicide in his grimy kitchen. Death stalks the artist’s psyche and creeps into all manifestations of his production. With All (2007), he created what he described as a “monument to death,” a sculpture that would commemorate its unrelenting presence. Derived from ubiquitous media imagery of fallen bodies, and carved from traditional marble, the nine shrouded figures appear as victims of some unnamed trauma, silently recalling the unconscionable realities of our present-day world. Cattelan’s career resists summation by any traditional exhibition format. Many of his early, action-based meditations on failure would be impossible to reconstruct, and his singular, iconic objects function best in isolation. Maurizio Cattelan: All is thus a full-scale admission of the inadvisability of viewing his work in the context of a conventional chronological retrospective. Characteristically, the artist resisted this model, creating instead a site-specific installation that cunningly celebrates its rebelliousness. The exhibition brings together virtually everything the artist has produced since 1989 and presents the works en masse, strung seemingly haphazardly from the oculus of the Guggenheim’s rotunda. 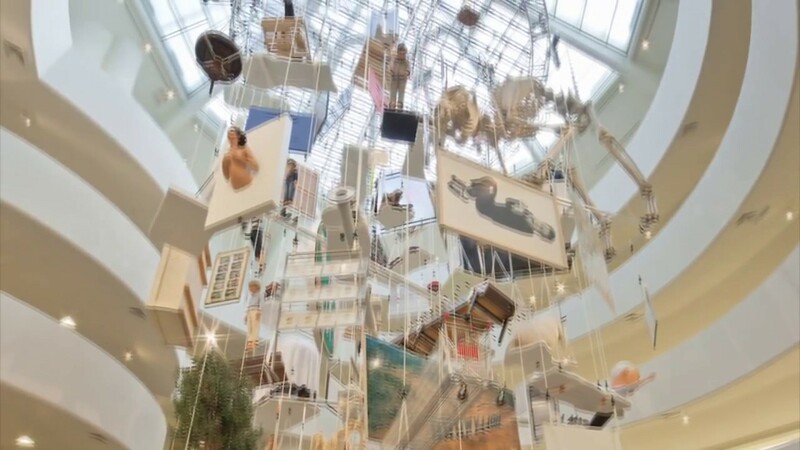 Perversely encapsulating Cattelan’s career to date in an overly literal, three-dimensional catalogue raisonné, the installation lampoons the idea of comprehensiveness. The exhibition is an exercise in disrespect: the artist has hung up his work like laundry to dry. Like all of his individual objects, the new installation resonates with multiple interpretive valences. Cattelan has certainly used the motif of suspension before, most notably in the poetically elongated sculpture created from a taxidermied horse, Novecento (20th century, 1997), but here it takes on epic proportions. Hoisted by rope as if on a gallows, the objects explicitly reveal the undertone of death that pervades the artist’s work. In total, the installation looks like a mass execution, and constitutes, for its duration, an overarching, tragic artwork in its own right.